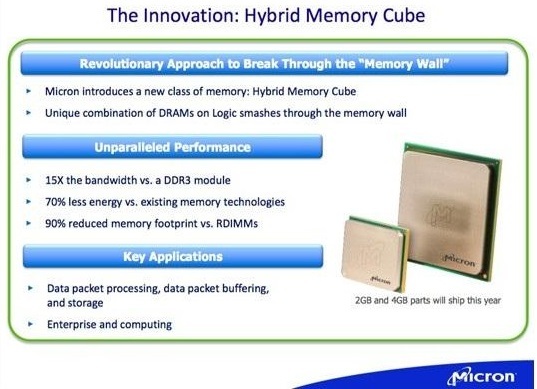 Micron announced its Hybrid Memory Cube will be used by servers and high-performance computers starting in 2015. This new memory technology has a bandwidth 15x higher than that of DDR3 memory and five times higher than DDR4. On top of this, it promises to use 70 percent less electricity versus existing memory technologies while also having a 90 percent reduced memory footprint versus RDIMM. Micron revealed that its HMC chips will initially be available in 4GB and 8GB variants, and that they will not have a DIMM design, the memory will have to be soldered onto the motherboard near the CPU. Along with the bandwidth boost, the new memory type will also draw 70 percent lesser energy. Micron plans to achieve this by stacking memory as stacked chips using a connection type called 'Through Silicon Via'. That said, the memory will be required to be soldered on the motherboard near the CPU. HMC will also have other features that are not present in DIMM-type DDR implementations. These include debug, more error correction features and also have logic layers.